Photo 1. 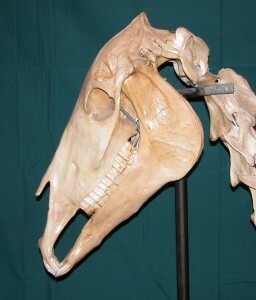 The horse’s skull and jaw. 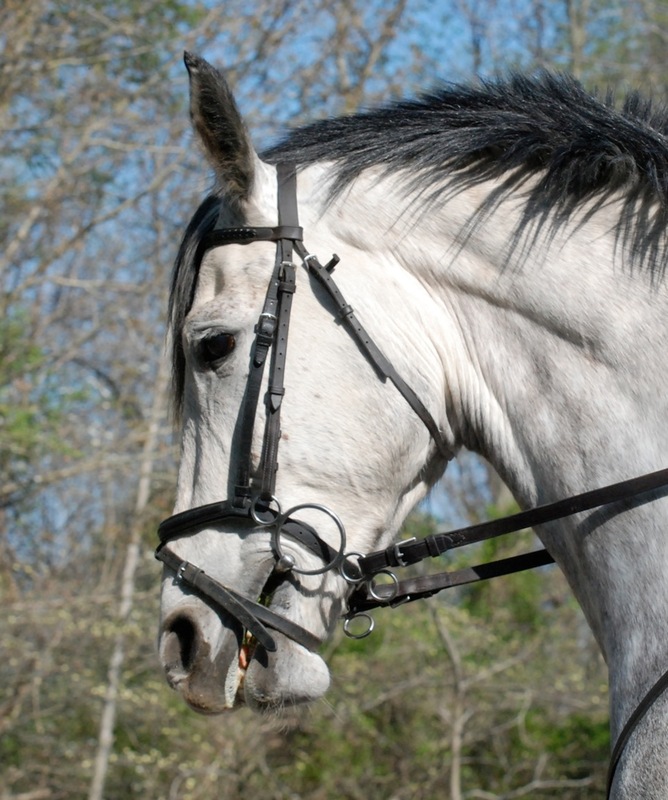 Does your horse have a tense jaw? Is it hard to get him to go forward? Is he unwilling to stretch forward and down? Does he chomp on the bit, pull his tongue back or otherwise fuss with his mouth? The answer may not be where you think! 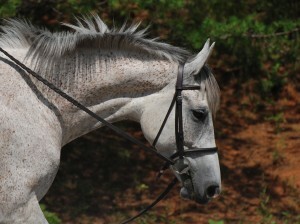 Horses often mirror the rider’s behavior and movements. 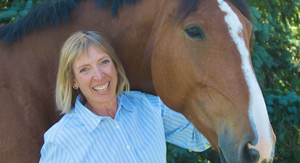 If you are having a problem getting your horse to softly accept the bit it is time to examine what you are doing with your jaw and mouth. Next time you ride notice your jaw. Do you clench your teeth? Do you hold one side tighter than the other? Do you pull your jaw back and up in order to “sit up straight”? 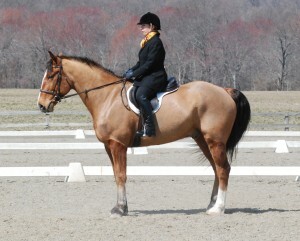 Do you tuck your chin or brace it forward especially when asking for transitions? Photo 2. The horse’s jaw is pulled up and back. Notice the effect on the tongue and tension in the throat. Lift your chin to the ceiling. Feel how your lower jaw slides back toward your throat. Now clench your teeth firmly enough that the jaw stays back. Lower your chin and feel what happens in your neck and lower back. What part of your spine is most involved when you lower your chin? Notice that your lower back tightens and you lower your head from your neck but the rest of your back remains stiff. With your head lowered let your jaw move forward and down. What changes in your back? How much easier is it to round your spine? What parts of your back become available when you chin goes forward? Keep the jaw forward and raise your chin to the ceiling. What happens in your neck and chest? Feel how your sternum stays down instead of rising as you look up. Let the jaw drop back. How does this influence your ability to look up? The jaw needs to be able to move forward and back as you look down and up in order distribute the movement throughout your spine. 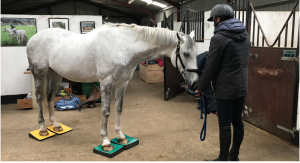 When we ride we want the horse to move forward allowing the push from his hind legs to travel through his back to his head. If the jaw is retracted back and up he will not be able to move forward into the contact correctly. The jaw and chin needs to move forward/down in all neck positions. 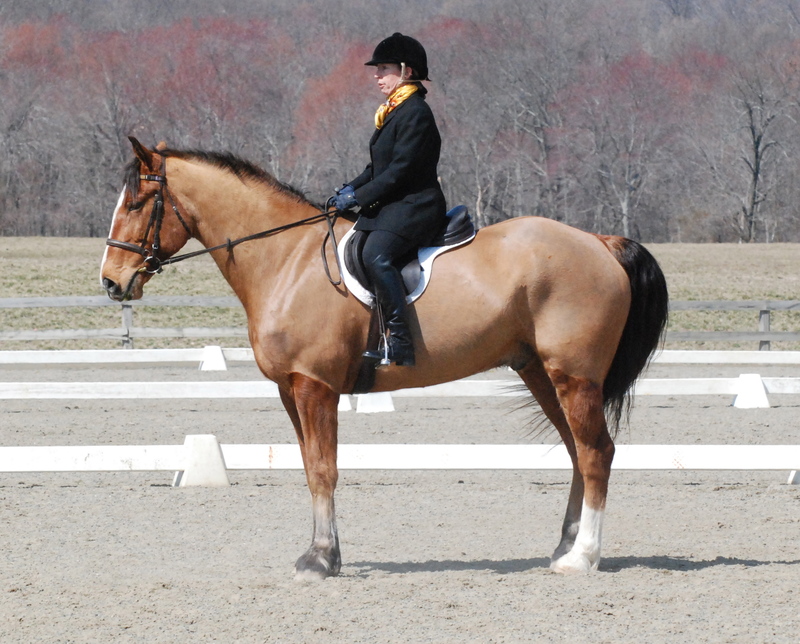 In a stretchy circle on a long rein the neck is lowered and nose moves out and down. On contact in a more collected frame the jaw still needs to move forward/down, which opens the space between the jaw and the first cervical vertebra. Photo 3. The horse is seeking the contact and taking the bit to the ground. Observe the space between the jaw and the throat and how the nose is going forward down. To find out if you horse can open this angle cradle your horse’s chin in your hand while standing in front and slightly to the side (so that he doesn’t accidently hit you with his head). Draw his chin forward slightly. Does he pull his jaw back and up when you do this? If so make a much smaller and slower movement. See if you can “invite” him to let the jaw move forward as you lower his head down. If this is difficult it could explain why you have difficulty getting him to take the contact, move freely forward and stretch down to the bit. This may also indicate teeth problems. Make sure you have his teeth checked by an equine dentist regularly. Observe what you do with your jaw when you drive your car, work at the computer or sit on your horse. Find out how often you tense your jaw or pull it back. Put a sticky note on your computer to remind you to let your jaw soften. Practice sliding the lower jaw softly forward and back with your teeth slightly parted and your lips together. Slide the jaw side to side. Which way is easier? Think of making flat circles (parallel to the ground) with your lower jaw as if it was a plate sliding around below your upper jaw. Feel how this softens the mouth. As you ride notice what happens to your horse’s jaw. Photo 4. On contact with shorter rein in a training level frame the horse’s jaw angle is still open and the nose is in front of the vertical. 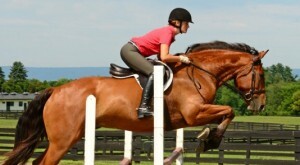 Use this Murdoch Minute to soften your jaw as you ride and allow your horse to go forward. Allow your jaw to move slightly forward to invite your horse to stretch forward/down and always remember to enjoy the ride!